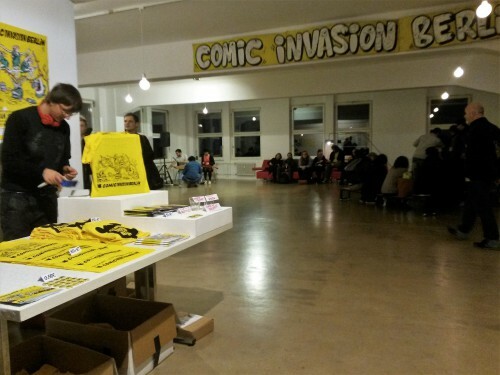 An impression from the opening of the 5th Comic Invasion Berlin (credit: Ronni Shalev). We have come a long way from weekly superhero installments and 4-panel strips in the Sunday paper. Comics today are everywhere, and they can range from graphic novels to near-abstract illustrations. They are created using pencils, paint, collage, digital mediums and just about any other tool that can make an image. Why do I think that comics are today’s most relevant art form? In an age of mass image sharing and self-published internet art, narrative illustrations are the natural successor to multimedia creativity. Existing alongside paper editions that make use of classical painting mediums, internet publications have .gif images for panels. Comics, one could argue, is the art form that is best suited for development in today’s internet age. The idea of combining simple text with narrative illustrations has been around since ancient times, but the past years have allowed digital art to integrate with classic drawing methods to create original and unique storytelling by blurring the borders between literature, illustration, and fine art. ComicInvasionBerlin, a festival which runs through the first two weeks of April 2016, aims to shine spotlights on up-and-coming artists’ work, to link between the local and international comics communities, and, as written in this year’s leaflet: “to showcase the scene and the medium in its contemporary form to a wide audience”. The festival was started in 2011 as a ‘mini indie street festival’ by a group of local comic book artists. Today, it attracts over 7,000 visitors and boasts a two-week program which includes exhibitions, competitions, workshops drawing battles and more. Last Friday, I attended the opening of this year’s festival, which has the theme “Up and Away: To a Better Place”. 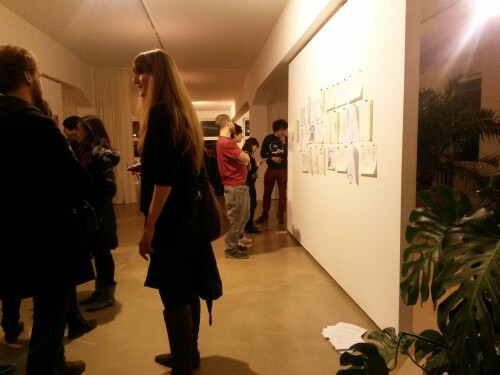 The opening was held at the Colonia Nova gallery in Neukölln and exhibited comic stories that were included in this year’s ComicInvasionBerlin comic contest and drawings from comic workshops in refugee shelters in Berlin. “To a Better Place” is a theme which gives artists the opportunity to initiate a dialogue with the events of Berlin’s past months. The festival offers unique perspectives on the ongoing refugee crisis from within a city that’s still questioning the role it plays in it. Festival participants include Syrian illustrators who have only recently arrived in Berlin alongside veterans of the city. Artists explore the concepts of migration and immigration and of the search for the perfect home both in the larger context of ‘refugees in Europe’ as in what it means to formulate a personal identity in a metropolis like Berlin. Something that struck me during the opening exhibition was how seamlessly ComicInvasionBerlin had integrated a the whole refugee community into the festival. Conversations in Arabic and German flowed around me in the exhibition space. A musical group called ‘Fattouch’, a Syrian-French-Romanian collaboration, gave a short concert. I saw comics about clubbing in Berlin alongside comics about navigating German bureaucracy and paperwork as an immigrant. The atmosphere was laid-back, open and genuine. ComicInvasionBerlin makes use of the most versatile art medium in the contemporary art world to shine light on Berlin’s most pressing current events. Its community-oriented and inclusive approach to the art of comic illustration produces engaging results and the next two weeks are extremely promising. Especially recommended is the festival’s closing bazaar, which will take place on the 16th and 17th of April. There you can buy prints, books, and meet and support local artists.